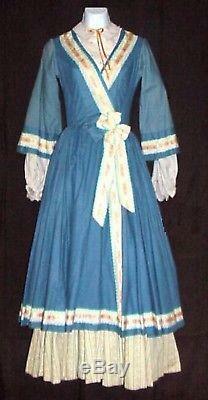 CIVIL WAR 1860'S / 1880'S PRAIRIE WESTERN FRONTIER PERIOD DRESS. WE SPECIALIZE IN OLDER VINTAGE MOVIE WARDROBE AND HAVE THOUSANDS OF REAL MOVIE WORN ITEMS IN CURRENT INVENTORY! The dress is done in a lovely federal blue and multi-colored cotton. 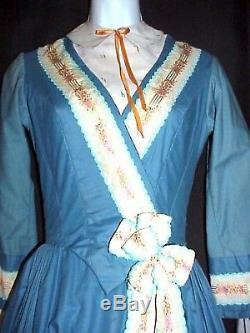 The bodice has a faux criss-crossed wrap front in the federal blue. 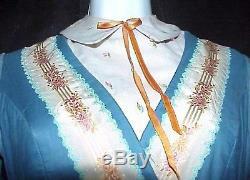 There is a center panel of ivory with small embroidered flowers in the squares of the material with a pointed collar and an orange satin ribbon at the center neckline. 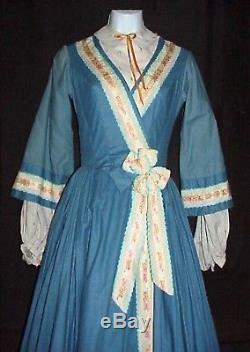 The bodice has rows of ivory ribbon edged in turquoise with a gold and pink floral pattern down the center of the ribbon over the shoulders and criss-crossing in the front. The dress has long sleeves done in 2 layers - the outer sleeve is done in a lighter blue cotton with a belled end. The cuff edge has the federal blue material around it with the multi-colored ribbon around the edge and going up a rear split in the sleeve as you can see in the pictures. The inner sleeve is done in the ivory material that matches the yoke area with the embroidered floral print. It has a gathered wrist with a small band and fastens with a hook and eye. The bodice is lined in a heavy cotton and has stays. It fastens with hooks and eyes. The two layer skirt is VERY, VERY full! 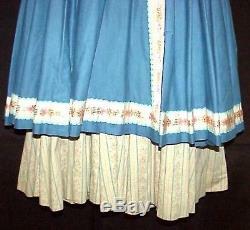 The long underskirt is done in a heavy cotton floral print in a cream color with turquoise print. 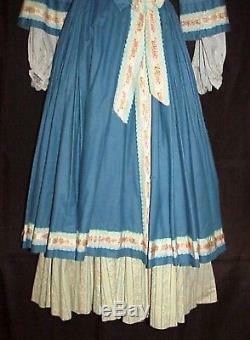 The outer skirt, which is shorter than the floral print one, is done in the federal blue and has cartridge pleating around the waist. It has the ivory ribbon edged in turquoise with a gold and pink floral pattern down the front and around the hem edge of this skirt. Both of the skirts fastens with snaps. It is in FABULOUS CONDITION for its age! This dress is tagged a 32" bust and a 22" waist. 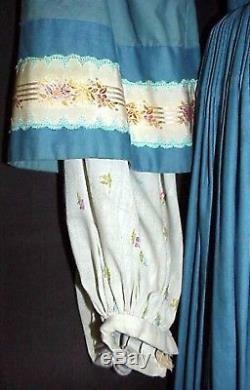 The underskirt is about 38" in length; the outer shorter skirt is about 31" in length. There is a small L shaped repair at the front of the skirt in a fold and a few very small holes just above the row of ribbon - maybe from a flower or some type of trim that has been removed. Please keep in mind the age of this dress and the fact that it WAS WORN in the movies it should be professionally cleaned! This is a beautiful collectable and needs to be seen to be appreciated. Please keep in mind we sell Hollywood Wardrobe that is collectable. Please remember Communication is EVERYTHING because we will bend over backwards to help our valued customers. 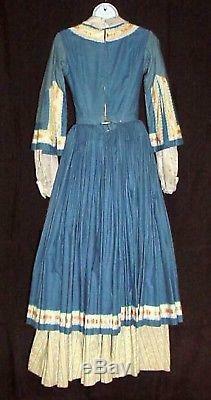 The item "CIVIL WAR WESTERN FRONTIER 1880s PERIOD DRESS FABULOUS" is in sale since Tuesday, April 3, 2012. This item is in the category "Entertainment Memorabilia\Movie Memorabilia\Wardrobe\Originals". The seller is "hollywoodmoviecostumes" and is located in Hesperia, California.